Stewart Stevenson, SNP MSP for Banffshire & Buchan Coast, has welcomed new statistics showing an increase in the number of Home Fire Safety Visits in Grampian – and has paid tribute to the hard work and dedication of Scotland’s fire service. Figures show that the number of Home Fire Safety Visits in Scotland rose from 56,251 in 2012-13 to 70,686 in 2013/14 – including a rise from 947 to 4369 in Grampian. “The men and women working in Scotland’s fire service do excellent work in our communities to promote safety and prevent fires – and these figures are a welcome example of their efforts paying off. “Over the year we saw the number of Home Fire Safety Visits in Scotland rise by almost 15,000 – including an increase of 3422 in Grampian. Stewart Stevenson, SNP MSP for Banffshire & Buchan Coast, has expressed his delight after two groups in his constituency netted a total of £15,930 in funding from the Big Lottery Fund. Radio Buckie received a £9600 Awards For All grant from the fund which they will use to purchase items and equipment for their new community radio station. An Awards For All grant of £6330 has also been made to Deveron Gymnastics Club from sportscotland. The club will use the cash to offer more classes, so that more young people can get involved as there is currently a waiting list. They will also train new coaches and further enable existing coaches. “I am very happy for both of the groups in my constituency that have received nearly £16,000 between them to help them in what they do in our community. “Radio Buckie was an excellent idea from the outset and it continues to develop and grow as a great local asset. I hope this added funding will further its ambition as a way of strengthening community spirit. Across the country, 165 community groups are sharing National Lottery funding worth £1,172,315. 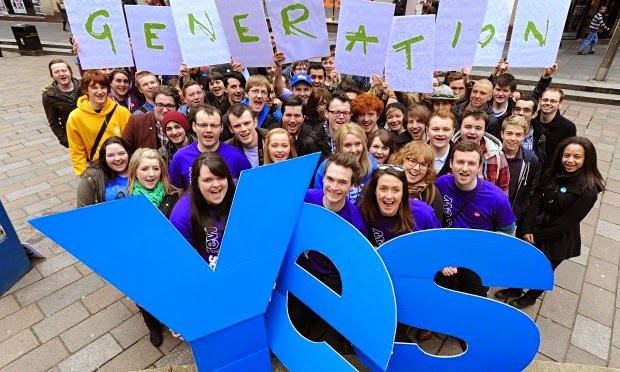 Stewart Stevenson, SNP MSP for Banffshire & Buchan Coast, has said he hopes that the upward trend in youngsters getting involved in politics continues to rise. “Getting youngsters engaged is not new, but there is a bit of a cycle to it and hopefully we are in an upward cycle that will continue. He added that schools played a vital part in last year’s referendum campaign as this is where around 50 per cent of voters were informed about the issues. Banffshire & Buchan Coast MSP Stewart Stevenson has hailed the securing of the £2.4million contract to build a new dredger for Moray Council by local firm Macduff Shipyards as great news for Buckie. The new vessel will be built at the company’s fabrication facility at Buckie harbour which the company acquired last year. Construction work on the 25.7m dredger, which will be powered by two 500hp engines, is expected to be completed by spring of next year. The intention is that the dredger will service Moray Council’s harbours – Buckie, Burghead, Hopeman, Findochty, Portknockie and Cullen – as well as being available for hire. The new dredger, which was designed by Macduff Ship Design Ltd, will be capable to dredging to a depth of 8m with its bow-mounted excavator. 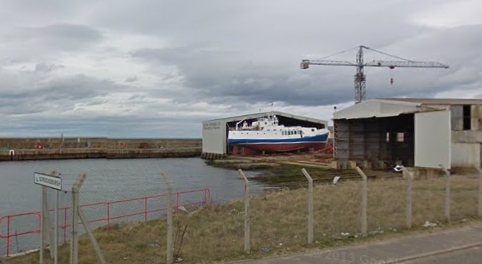 “This is great news for Buckie and for Macduff Shipyards. It serves to further develop the already vast expertise of the company and, importantly, keeps these skills in the local workforce. Banffshire & Buchan Coast MSP Stewart Stevenson has welcomed the announcement from Northern Oils of their latest expansion. Lintmill-based National fuel and lubricant supplier Northern Oils announced this week that they will commence operations from their new site at Workington on 1 March. 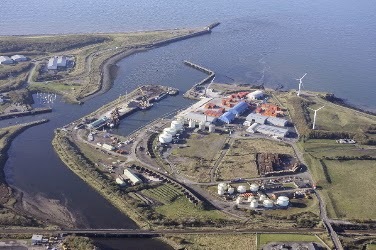 The Cumbrian Storage Terminal represents a key location for the group who have land and sea operations around most of the UK coastline. The Workington facility benefits from having road, rail and sea loading facilities meaning it will become a key fuel storage and distribution centre for the North of England in particular with millions of litres held on site. It is anticipated that at least one of Northern Oils own ships will operate from the Port of Workington. “This is further good news for local company Northern Oils and I congratulate David Wood and his team at Lintmill on this expansion. Stewart Stevenson, SNP MSP for Banffshire & Buchan Coast, has pledged to fight for Scotland’s NHS by calling on Prime Minister David Cameron to use his veto to protect the NHS from the effects of the Transatlantic Trade and Investment Partnership (TTIP). SNP MSPs led by First Minister Nicola Sturgeon have signed Unite’s pledge to demand that David Cameron takes action against TTIP unless the NHS is “fully and clearly exempted” from the agreement. “I believe in protecting the NHS from privatisation so that it remains in the hands of the people of Scotland, and answerable to them. This is why we are calling on the Prime Minister to veto any agreement where TTIP does not explicitly exempt the NHS. “The NHS is vitally important to the people of Scotland and we want to be clear that we are fighting for this invaluable institution, and that it is protected. This is one of the SNP’s main priorities in our Westminster campaign. We want to make sure that we gain enough clout to protect our budget from the Westminster agenda of austerity, patient charging and privatisation. 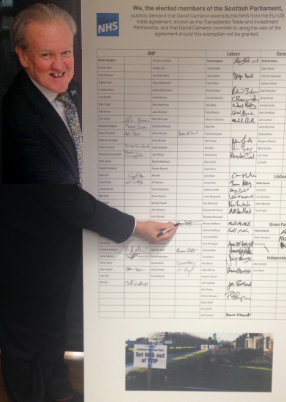 Stewart Stevenson, SNP MSP for Banffshire & Buchan Coast, showed his support for improved Pancreatic Cancer research, awareness, diagnosis, treatment and care by visiting an exhibition at the Scottish Parliament this week. The exhibition stand was manned by representatives of Pancreatic Cancer UK and Pancreatic Cancer Scotland, and included information about the disease as well as a ten point plan from Pancreatic Cancer UK, calling for faster diagnosis and a better patient experience. “I was pleased to be able to show my support for pancreatic cancer patients, and the charities who work on their behalf, by visiting the awareness stand in Parliament. One person across the UK is diagnosed with pancreatic cancer every single hour. In Scotland, pancreatic cancer is the sixth biggest cause of cancer death, with 770 cases diagnosed, and 742 deaths recorded in 2012. Five year survival rates in Scotland are just 3.2 per cent, which is below the UK average of 4 per cent. These are the lowest survival rates of the 21 most common cancers. “Pancreatic cancer has the worst survival outcomes of any of the most common cancers and we need to do more to improve pancreatic cancer awareness, diagnosis, research, treatment and care across Scotland and the rest of the UK. Pancreatic cancer is still the fifth most common cause of cancer deaths in the UK yet receives only one per cent of the total cancer research spend. Stewart Stevenson, SNP MSP for Banffshire & Buchan Coast, focused on the ‘unacceptable’ number of teacher vacancies in Moray at Topical Questions in the Scottish Parliament today (Tuesday). Mr Stevenson asked the Education Secretary Angela Constance what contact was being made with Aberdeenshire Council to establish why the situation had arisen in Moray, and what steps were being taken to address the deficiency. The Education Secretary said that efforts were being made at local and national level, and that she had met with representatives from Aberdeen City Council, Aberdeenshire Council and Moray councillors. 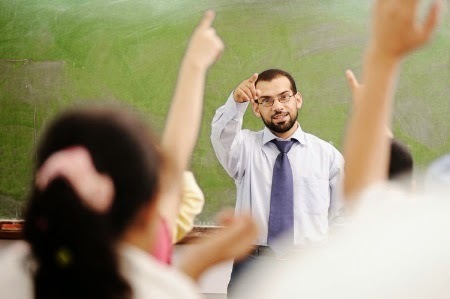 “A number of actions are being taken - at national level, for example, for the fourth year in a row we have increased the number of students going into initial teacher training. The increase has been disproportionately geared towards the University of Aberdeen, the University of Dundee and the University of the Highlands and Islands to help those geographical areas where there are shortages. Mr Stevenson welcomed the efforts being made and urged that everything should be done to remedy the situation. “I am glad to hear that the Education Secretary is taking the teacher vacancy situation in Moray seriously and that measures are being taken to work towards alleviating the situation. Stewart Stevenson, SNP MSP for Banffshire & Buchan Coast, has welcomed ‘real progress’ made by NHS Grampian in addressing the recommendations of a Healthcare Improvement Scotland report published last year. The statement was made by Health Secretary Shona Robison today (Monday) before visiting Aberdeen Royal Infirmary. Ms Robison said that the new leadership at the health board had “moved NHS Grampian forward” and changes were being seen, with work being done to recruit more nurses, better investigation of complaints, and sustainable plans developed to further improve unscheduled care. “NHS Grampian have had a number of challenges to address over the last number of months, and in December, Healthcare Improvement Scotland identified recommendations for the board to take forward. The Scottish Government is supporting the changes in NHS Grampian with a £49.1 million increase to the health board’s budget confirmed for the next financial year – equating to a 6.3 per cent rise. This is the highest uplift of any territorial health board within Scotland and will bring NHS Grampian to within one per cent of NRAC parity, the NHS funding formula. 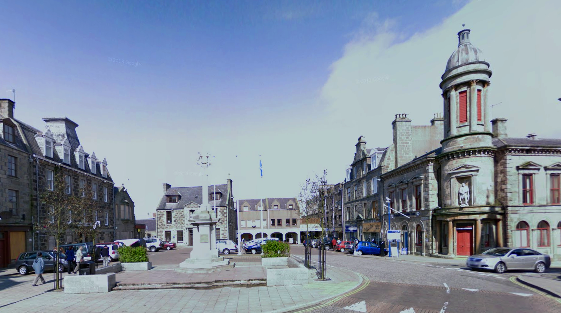 News that Fraserburgh Town Centre has won the lottery with a cash boost from the Heritage Lottery Fund has been welcomed by local MSP Stewart Stevenson and Banff & Buchan MP Eilidh Whiteford. The fund’s Townscape Heritage Programme will provide up to £58,000 to assist in preparation for £1.8million of regeneration works, including restoration of the historic Saltoun Chambers. “This is tremendous news for Fraserburgh and I congratulate all those involved in this successful bid. “Regenerating Fraserburgh is all about partnership working between local businesses, public bodies and civic society. I’m pleased to see Fraserburgh getting a fair crack at some lottery cash to help it along. Buckie Branch SNP held a successful Coffee Morning in Deskford on Saturday, attracting a large crowd. The event, held in the local hall, was also attended by Banffshire & Buchan Coast MSP Stewart Stevenson and Buckie councillor Gordon McDonald. “I was delighted to be able to attend the Deskford Coffee Morning and find myself among such a large group of people. A register of lobbying should be established according to a report issued today (6 February 2015) by the Scottish Parliament’s Standards, Public Appointments and Procedures Committee. The proposed register would make information about lobbying activity around decisions made by Parliament and Government more transparent and accessible to the public. The proposed register would cover ‘significant’ lobbying activity. This is where organisations have sustained contact with politicians or where organisations spend significant money employing staff to seek to influence MSPs. “Lobbying is a legitimate, valuable and necessary part of a healthy democracy. The more voices that feed into the Parliament and Government the more informed we are in our decision making and scrutiny. But a Parliament founded on openness must seek to make clear who is lobbying, on what issues, and why. The Scottish Government announced in June 2013 that it intended to legislate on the issue of lobbying and the Committee is recommending that the Government use its proposals as a basis for legislation. “Ever since it indicated it would legislate on lobbying, the Government has made clear the Parliament should have a central role in the policy development. The Committee is unanimous in recommending change, and its proposals have been consulted on to ensure they’re practical and not overly bureaucratic. Stewart Stevenson, SNP MSP for Banffshire & Buchan Coast, has welcomed the announcement that a Scottish dairy brand will be launched this year to promote Scottish produce internationally and provide additional support for hard-working dairy farmers. Cabinet Secretary for Rural Affairs Richard Lochhead has announced that he will publish a detailed dairy action plan shortly which will contain plans for the dairy brand, in addition to other measures that will promote Scottish products. “This is a very welcome announcement by the Scottish Government and will provide real support for local dairy farmers while further boosting the Scottish economy, making it easier for consumers to choose Scottish products first. “Scottish food and drink has an exceptional reputation across the world and this new dairy brand will help further showcase Scotland’s produce and allow our farmers to further capitalise on this proud reputation and access more export opportunities. Stewart Stevenson, SNP MSP for Banffshire & Buchan Coast, has welcomed new figures that show between 93-95 per cent of patients across NHS Grampian were seen within the four hour A and E waiting time target in the last three months of 2014. Last October 93.6 per cent in NHS Grampian reached the four hour target, in November this went up to 95 per cent and there were 94.4 per cent in December 2014 seen within the set time. These figures exceeded the national averages which were 91.8 per cent for October and November 2014, and 89.9 per cent for December 2014 respectively. Mr Stevenson praised the work of staff across Aberdeenshire as this winter has seen unprecedented pressures on A and E departments. Attendances in 2014 were the highest seen in any year since records began. In the quarter ending in December, attendances were up from last year, and there were over 9000 more people attending A and E. Admissions to hospital following an A and E attendance were also at their highest level on record with 101,488 people admitted over the quarter. “I warmly welcome these figures which go to show how fantastic our NHS staff is in the face of a very challenging winter. Cabinet Secretary for Health Shona Robison admitted that the Scottish Government’s demanding targets had not been met, but that they were determined to improve performance. She added that the Government’s £50 million unscheduled care action plan and a fresh approach to embedding good practice in emergency care across Scotland were the right way to improve performance.